WARSAW — The Warsaw Police Department DARE program is celebrating a major milestone. The program was first implemented in Warsaw Community Schools on Sept. 5, 1988, by then Chief Craig Allebach, after learning about the program at an International Chief’s Association meeting. The program originally launched in 1983 as a partnership between the Los Angeles Police Department and the Los Angeles Unified School District. Unlike all other drug prevention curriculum, LAPD police officers were trained to teach the DARE curriculum, thereby putting a local “human face” on drug prevention in schools. In 1983, virtually no classroom teachers were receiving instruction in their college courses about drug use/abuse or any instruction on how to deliver drug prevention lessons. Increasing awareness of DARE and LAPD officers training other local law enforcement officers to deliver the original DARE curriculum resulted in the rapid and widespread adoption of the program throughout the country. Since the inception, ten WPD officers have been trained and assigned to DARE, including current officers Roy Navarro and Allen Danko. Officers within the program must undergo a selection process and attend two weeks of training before being certified. The curriculum, which is scientifically based, is the national symbol for the Drug Abuse Resistance Education program which, in partnership with police officers, parents and schools, is in use throughout the country. The DARE program has evolved nationally, conducting training for new DARE officers annually. The program has been offered to all WCS sixth grade students, offering decision-making skills for a healthy life over the past 30 years. 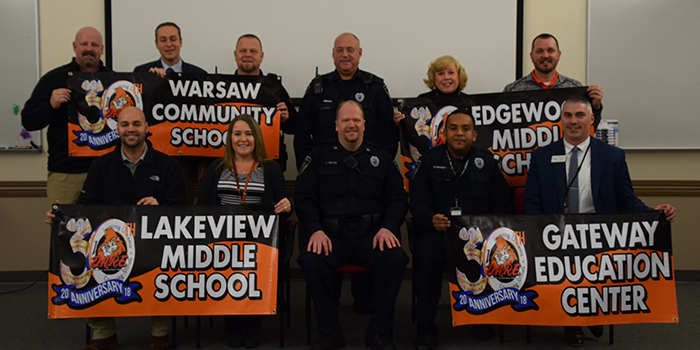 Since the inception of Warsaw Police Department’s program, many changes have occurred in terms of both curriculum and graduation practices. All graduations are now held at the Grace College Manahan Orthopaedic Capital Center. Warsaw Police Department and Warsaw Community Schools would like to congratulate Officer Navarro for being nominated by his peers and selected by the Indiana training team to serve as a DARE mentor and trainer. Together, we look forward to the next 30 years. 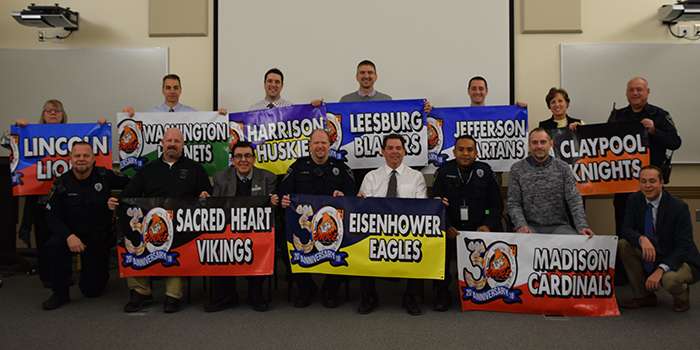 Pictured, from left in front, are Warsaw Police Department Officer Brandon Zartman, WPD Chief Scott Whitaker, Sacred Heart School Principal James Faroh, WPD officer Joel Beam, Eisenhower Elementary School Principal Chris Gensinger, WPD officer Roy Navarro, Madison Elementary School Principal Ben Barkey and Warsaw Community Schools Superintendent Dr. David Hoffert. In back are Lincoln Elementary School Principal Cathy Snyder, Washington STEM Academy Principal Tom Ray, Harrison Elementary School Principal Matt Deeds, Leesburg Elementary School Principal Nathan Polston, Jefferson Elementary School Principal Kyle Carter, Claypool Elementary School Principal Melissa Rees and WPD Officer Greg Oberlin.